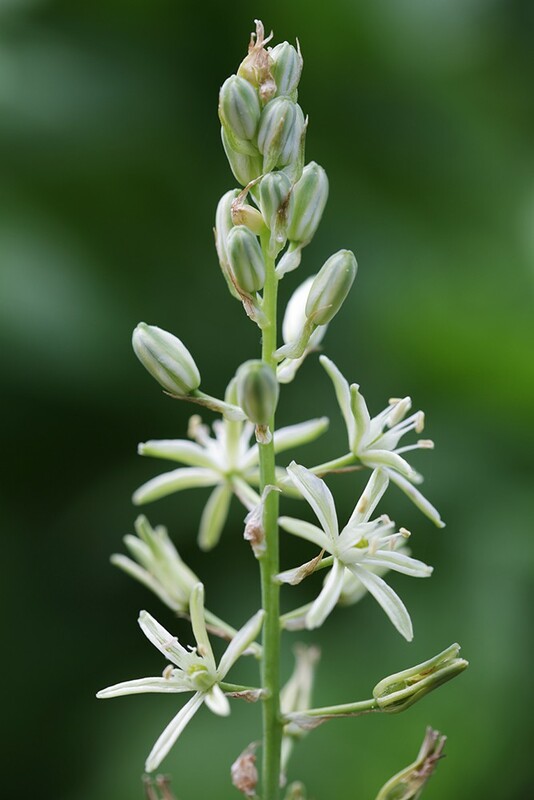 Bath Asparagus, also known as Spiked Star of Bethlehem, is a handsome plant with narrow, glaucous leaves and a flower spike that can reach up to 2ft high and contain as many as fifty flowers. Each flower is slightly less than an inch across and is star shaped with six, green striped, greenish-white petals. Flowers can be found throughout June and July. Bath Asparagus is medium height, bulbous perennial. Due to its patchy distribution some think it was introduced in to England, probably by the Romans, however the more recent consensus is that it is a native and that its very restricted distribution is due, in part, to its large seeds which make dispersal difficult. As its name suggests Bath Asparagus occurs in its greatest numbers around Bath but it can also be found in other parts of Somerset, Wiltshire and Gloucestershire with a satellite population in Bedfordshire. It grows in woods, hedgerows, road verges and rough grassy banks usually on clayey soils overlaying limestones or gravels. In the past Spiked Star of Bethlehem was grown commercially and sold in Bath market for its young, unopened flower shoots which can be eaten in the same way as asparagus, hence the local name. It is probably best to sow Ornithogalum pyrenaicum in the autumn.If sown in situ plants take about five years to flower. If sowing in pots leave the seedlings undisturbed for the first two years with maybe the occasional feed with a liquid fertilizer. At the end of the second year divide the bulbs and add two or three in each pot and leave to grow for another year before planting out in the open.